I've pinched this from the BBC but I thought it was well enough written that I didn't have to bother! We can't even swim in the sea now! "In high-income countries like the UK, there is a perception that there is little risk to health of spending time in the sea," said Dr Anne Leonard. "However, our paper shows that spending time in the sea does increase the probability of developing illnesses, such as ear ailments and problems involving the digestive system, such as stomach ache and diarrhoea. "We think that this indicates that pollution is still an issue affecting swimmers in some of the world's richest countries." Research supervisor Dr Will Gaze said: "We don't want to deter people from going into the sea, which has many health benefits such as improving physical fitness, wellbeing and connecting with nature. "However, it is important people are aware of the risks so they can make informed decisions." He added: "We have come a long way in terms of cleaning up our waters, but our evidence shows there is still work to be done. "We hope this research will contribute to further efforts to clean up our coastal waters." Ready for Ice from the East? With the temperatures hitting some icy lows, perfect your ‘ice walk’ this March with top tips from the British Chiropractic Association. Snowy and icy roads and pavements mean potentially hazardous conditions underfoot and a rise in injuries caused by slips and falls. It is quite natural, therefore, for us to be wary when walking outdoors and adopting our ‘ice walk’; the problem is that an unnatural walking posture could cause as many problems as the icy conditions themselves. – It is a good idea to have two pairs of shoes, one for walking in the ice and snow, the other for indoors or whilst driving. – Waterproof or other, lined shoes are preferable as are thermal socks, as these items will help keep your feet warm. Cold, numb feet are less able to sense and adapt to changing conditions. – Footwear should have a solid and large, raised treads on the sole; essential for maximising your grip on the ice. – Shoes with support features are important – walking shoes with a firm ankle support are ideal as they help prevent you ‘going over’ on your ankle and help you feel more stable in slippery conditions. If shoes have laces, they should be firmly laced to give a close fit without limiting the circulation. What to avoid…..Wellingtons can be practical, but they often don’t give enough support and can be difficult to take off. Also avoid walking outside in leather or other, smooth soled shoes. If you do fall, try and curl up and ‘roll’ with the fall and stay relaxed, this will minimise any jarring to your body. Whilst it may be an automatic reaction, try to avoid putting your hands out to save you – this may cause wrist injuries. Try to avoid alcohol. Not only will you be more prone to feeling the adverse effects of the cold (because alcohol causes loss of body heat) but it may also cause you to take risks that you wouldn’t normally do and, of course, make you more unsteady on your feet. Keep topped up with warm drinks to keep your temperature up. I saw this the other day and thought it was brilliant! Give it a try. Ten days ago, I went on my annual trip to the Royal College of Chiropractors Winter Conference in London. A lot of it was dull, very dull. However, at the conference was a speaker named Ann Gates who talked about the importance of exercise for all sorts of health conditions. These were things that I already knew but that I had almost forgotten. Her main point was that if exercise was a drug that you could get from your GP, if would be hailed as a miracle. A drug that reduces all causes of death by 30%! The other information that I liked was the amount of exercise that different groups of people require. As you can see from the pictures below, 0-5 year old's need 3 hours of moderate intensity exercise per day. 5-18 year old's need 60 minutes per day and everyone over 18 years of age needs 150 minutes per week MINIMUM. ​As the rather excellent NHS website states "Moderate activity will raise your heart rate and make you breathe faster and feel warmer. One way to tell if you're working at a moderate level is if you can still talk, but you can't sing the words to a song." I would strongly encourage everyone to visit the NHS website I mentioned above by clicking HERE. The page you will be taken to is for adult recommendations but there are links to the children's versions too. As you will see when you visit the NHS website, their are different ways to get your quota in. You can do 75 minutes of vigorous exercise instead. As a general rule, you can half the amount of time required if the exercise is vigorous. The recommendations for adults also state that strength training should incorporated into our routines. However, the easiest way to think of it really is to do 30 minutes of some sort of exercise every single day. That way, you've got it covered. I think the most important thing to take away from all of this is that most of us could do a little more than we do currently. 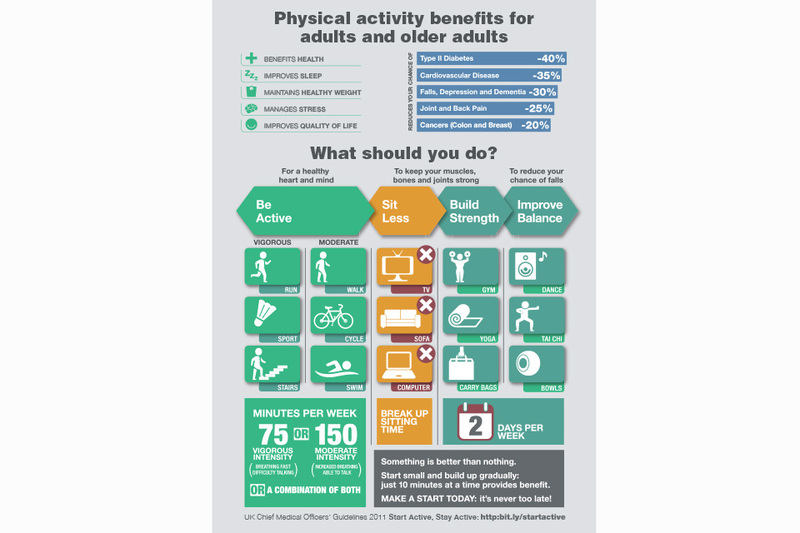 As the picture at the top of this article shows, the benefits of exercise really are incredible and we can all access those benefits with some fairly small changes.